Our first speaker at the London Honey Show was Judy Earl, who is a master at turning hive products into something beautiful, useful or tasty. 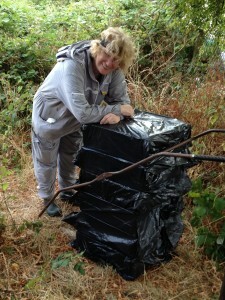 Judy has been beekeeping 10 years and has 12 hives in Harrow (northwest London). I was amazed to find that she knew me when I approached her table of goodies, as she reads this blog! Hello Judy! 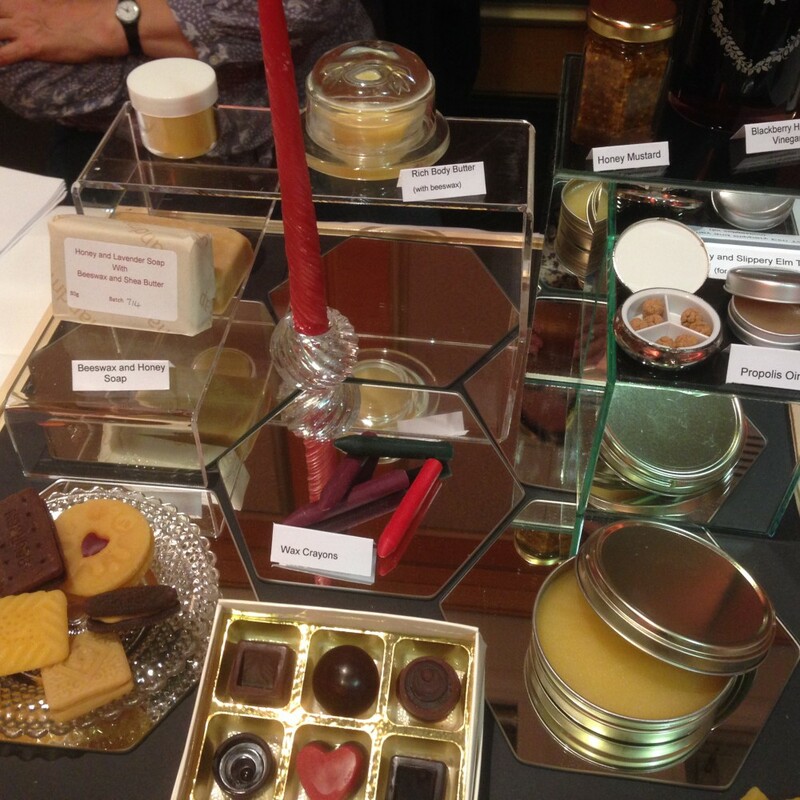 She had a mind blowing number of hand-made things on show – beeswax & honey soap, body butter, wax crayons, candles, wax chocolates and wax biscuits to name a few. Can you believe these aren’t edible? Judy should be working at Madame Tussaud’s! 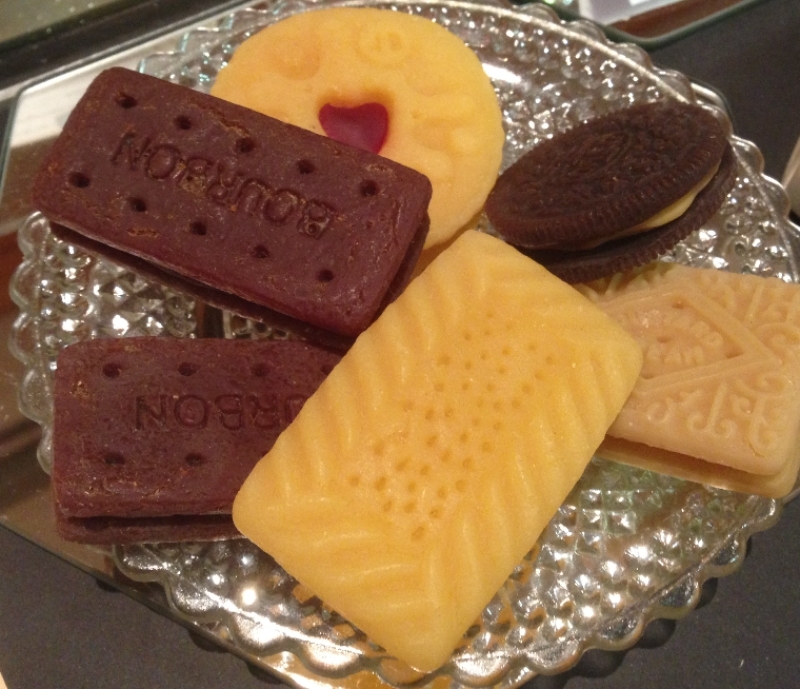 Several British classic biscuits replicated in all their glory here – the Jammie Dodger, the Custard Cream, Scottish Shortbread and the chocolate Bourbon. I have forgotten the name of the round chocolate sandwich biscuit. The shine and precision of these ‘chocolates’ is astounding too. Really wish Judy could take my Module 2 exam on bee products for me. Judy was brought up on a honey & cider vinegar mix when she had colds. She uses a honey & chilli rub for aching muscles. She’s made a honey & garlic chest rub before too, though she admitted that didn’t smell too good! Honey & yoghurt makes a great face mask, but don’t put it on and get in the bath, as the honey melts and stings your eyes! 6g beeswax – cappings wax from untreated supers is generally cleanest. 60g oil – for example, almond, avocado or olive. Melt the beeswax and mix with the oil. A nice thing to do with vodka is soak your honey cappings in it for about a month, along with some frozen fruit, to give the vodka a sweet, fruity flavour. 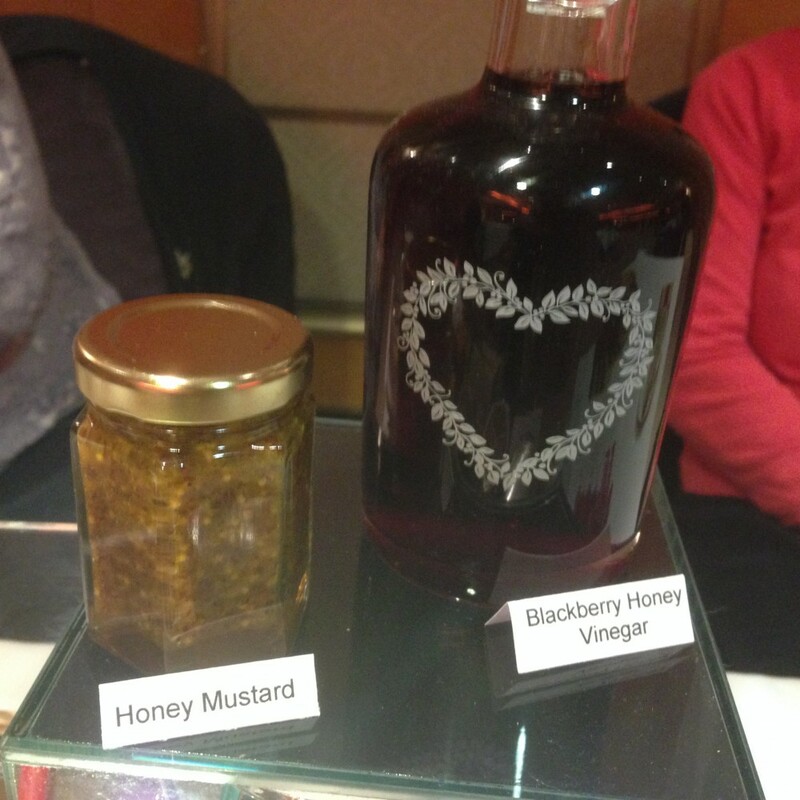 Judy also had a beautiful blackberry honey vinegar on display, which she kindly gave us the recipe for. Put vinegar and blackberries in a big jar. Leave to steep for a week, shaking daily. Strain and bring to the boil, add the sugar and honey, remove from heat and stir till all dissolved. Bottle into a sterilised suitable bottle. Here’s a photo of her honey mustard and the vinegar – I just love its rich red colour. Use rough beeswax for this and mix the two together. To make soft polish for leather, add soap flakes. Judy commented that the hardest part of polish making is finding decent polish tins to put it in! It’s none of my beeswax . . . Funny, usually you’re only too happy to wax lyrical.
. . . misplaced my lyre . . .
Emily, while we are on about polish, I recall reading somewhere that the word SINCERE came originally from the Italian marble quarries where defects and cracks were often slyly obscured using beeswax only to manifest themselves later. Such a shame those chocs aren’t edible! Love that explanation of SINCERE from Jonathan, although I know it’s disputed. That round biscuit looks a bit like an American Oreo, but maybe not black enough! You are right, it does look like an Oreo! Are you the lady who’s coming to talk to Watford Townswomen’s Guild on November 14th? Judy won’t see your message on my blog but I have sent her a message on Facebook to ask. What fun…I would love to be able to purchase her wares. I will ask Judy if she sells them. You’re right, she has such original ideas as well as a lot of skill. 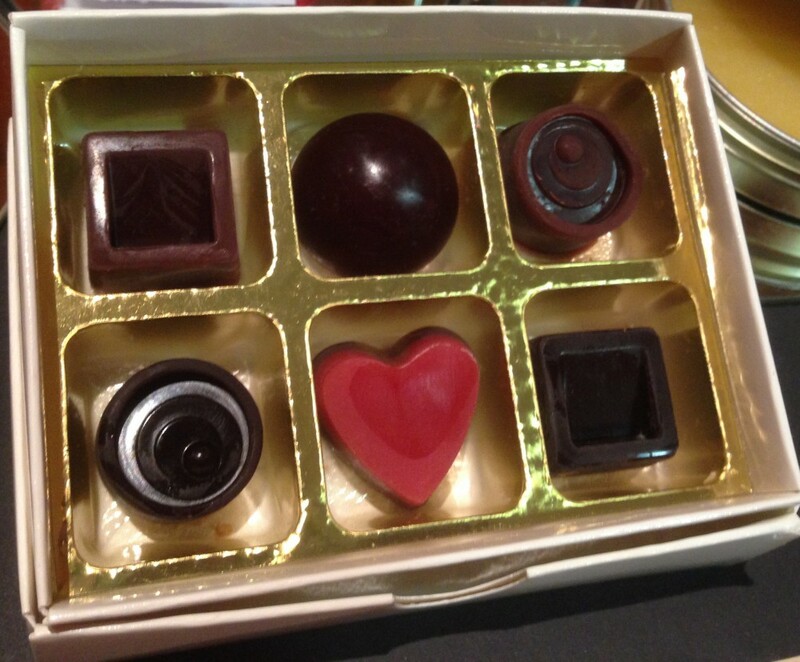 That box of chocolates looks even better than the real thing! The National Honey Show sounds like beekeeping heaven. I must go to the National show some time, although some people say the honey gets pretty boring to look at! There are really good lecturers and an exhibition too though. Enjoyed your post about the honey talk you went to – the Italian way of doing things and concentrating more on taste than perfectly sparkling jars sounds better to me. What inspiring ideas for what people can get up to with their wax! The chocolate bourbon had be drooling, cannot believe it is made from wax. I know right?! The next step would be to give it a chocolate scent! Thank you for the recipe. I will try to make the honey vinegar. Glad you liked it, I’m very grateful to Judy for letting me put it up here. What on earth do you use with the vinegar? That sounds incredible, but I’m wracking my brain to figure out how I can use it. It sounds a lot like a vinegar reduction I had at a cheese plant once. It was so tasty. The answer has been provided below by theresa – her gran used it for coughs & colds! Alternatively – salad dressing? Delicious post – so many inspiring products. My grandmother used to make raspberry vinegar that she administered for coughs & colds, honey was added for kids to help the medicine go down. I am also a great advocate of lemon and honey in hot water at the first signs of a sniffle. Me too, when I’m ill honey has to be added to any hot drink I’m having. Never heard of raspberry vinegar as a cold cure before!